Pigs are social animals. Generally, mixing animals that do not know each other will result in aggression. This tendency to fight will increase under conditions of competition for resources such as space, feed and water. 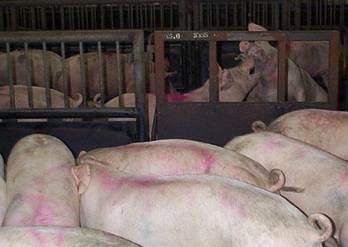 Pigs that are lairaged in individual stalls experience high levels of stress due to isolation. The system of driving pigs to stunning can take advantage of the natural behaviour of the pig so that the animals follow each other. Slaughter pigs fighting in a crowded lairage pen. Photo: Anne Algers.